The annual tournament, founded in 1997 to foster innovation in artificial intelligence (AI) and robotics research, is often touted as the world's biggest robotics and artificial intelligence event. Though the competition is fun, the AI research that is required to compete could someday lead to enhanced bomb-searching robots; autonomous cars that increase traveling efficiency and reduce automobile accidents; self-healing, smart computers; and AI agents that manage business supply chains more effectively than humans. UT Austin Villa defended its 2011 3D Simulation League title, featuring artificially intelligent robots that compete in simulated soccer games. For the first time in university history, the Texas team also won the RoboCupSoccer Standard Platform League (SPL) competition  one of the highest profile leagues at RoboCup. 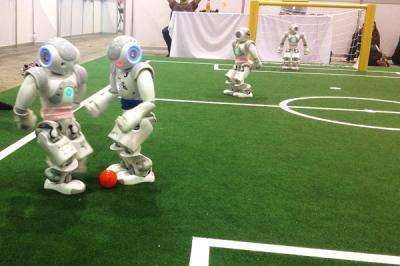 RoboCupSoccer SPL consists of teams using state-of-the-art, fully autonomous, humanoid Nao robots. Because the robots are standardized, teams concentrate on software development and programming the robots to "think" and play the game. "I'm incredibly proud of the students for the great work that they put in, and especially the great research behind the success that made it all possible," said Stone, a professor in the Department of Computer Science. The Texas SPL team blew through its first round robin games and quarterfinal, winning each by at least a 4-goal margin, and won a nail-biter in the semifinals to go on to compete against the University of Bremen in Germany, the undefeated champions three years in a row. In the championship game, the Texas team took on an early 2-0 lead in the first half, claiming victory by a final score of 4-2. UT Austin Villa's SPL team includes Stone, doctoral students Todd Hester, Sam Barrett, Katie Genter, Piyush Khandelwal and Jake Menashe, and master's student Yuchen He. The simulation team consisted of Stone, doctoral student Patrick MacAlpine and undergraduates Adrian Lopez-Mobilia and Nick Collins. "In some sense, my team has been working toward this since I founded UT Austin Villa back in 2003," said Stone. "We are savoring the success of this RoboCup competition!" CJS & ITS MEMBERS GONE MAD AT UT!